Linksys Wireless-G Access Points can be configured as an Access Point, Access Point Client, Wireless Repeater, and Wireless Bridge. The Wireless Bridge mode will turn the access point into a wireless bridge. Wireless clients will not be able to connect to the access point in this mode. NOTE: When an access point is configured as a wireless bridge, it will link a wireless network to a wired network allowing you to bridge two networks with different infrastructure. NOTE: When the WAP54G access point is set to wireless bridge mode, it will only communicate with another Linksys Wireless-G Access Point (WAP54G). 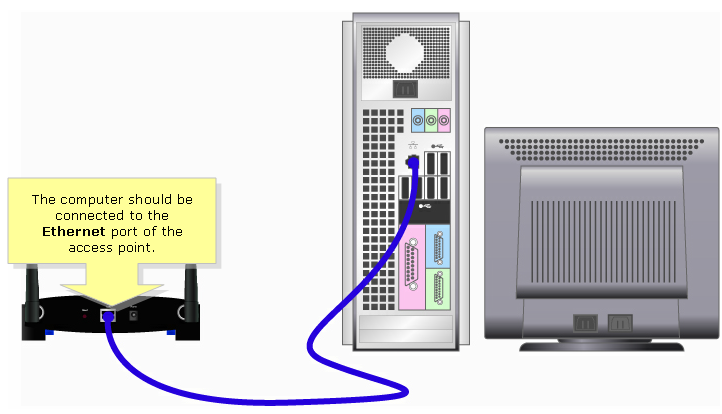 NOTE: The following steps will be performed on the main access point using a wired computer. Connect a computer to the access point. Assign a static IP Address on the computer. For instructions, click here. Open the access point’s web-based setup page. For instructions, click here. NOTE: If you are using Mac® to access the access point’s web-based setup page, click here. When the access point’s web-based setup page opens, take note of the Wireless MAC Address. NOTE: The Wireless MAC Address you took note of will be entered on the WAP54G set as wireless repeater. After obtaining the wireless MAC Address of the access point, configure the other WAP54G as a wireless bridge. For instructions, follow the steps below. Connect a computer to the access point you want to configure as a wireless bridge. When the access point’s web-based setup page opens, click AP Mode. NOTE: The access point’s web-based setup page may differ depending on the access point’s version number. Select Wireless Bridge and type the remote access point’s MAC Address that you took note of earlier. NOTE: Remove the colons (:) when typing the MAC Address on the Remote Access Point’s LAN MAC Address field. After configuring the access point as a wireless bridge, change its LAN IP Address to avoid IP Address conflict. For instructions, click here.